"Vipassana Meditation: A Practical and Spiritual Path"
The talk will describe Vipassana as a psychological practice that increases adaptability and richness in the lives of its practitioners. 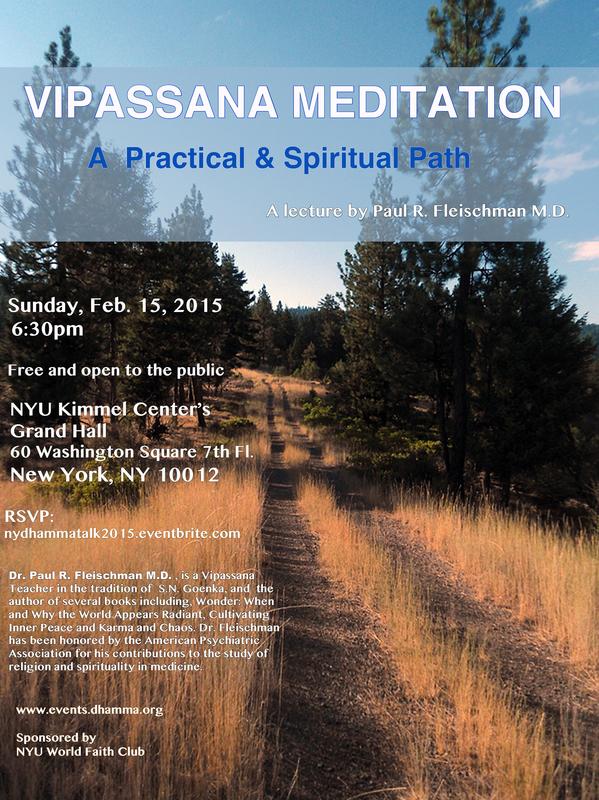 Please join us for a talk with renowned author, psychiatrist, and Vipassana meditation teacher Dr. Paul R. Fleischman. This one-hour talk begins at 6:30 p.m. and will be followed by a 30 minute Q&A session where Dr. Fleischman will answer questions from audience members. Line A, B, C, D, E, F, or M to West Fourth St.
Line 1 to Christopher St. Line N or R to Eighth St.
Line 6 to Astor Pl. About Paul R. Fleischman M.D. 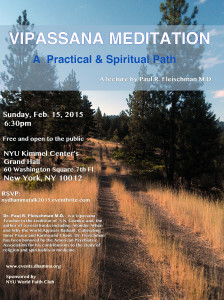 Dr. Paul R. Fleischman is a Vipassana meditation teacher in the tradition of S.N. Goenka. He trained in Psychiatry at The Yale School of Medicine, where he also served as chief resident, going on to practice psychiatry for more than 30 years. He is the author of books such as Wonder, Cultivating Inner Peace, Karma and Chaos, and An Ancient Path. He has lectured widely in the Americas, Asia, and Europe. He was honored by the American Psychiatric Association for his contributions to the study of spirituality and religion in medicine. Vipassana, which means to see things as they really are, is one of India's most ancient techniques of meditation. It was taught in India more than 2500 years ago as a universal remedy for universal ills. Today it is being taught in more than 150 meditation centers throughout the world. For more information, visit: www.dhamma.org. For more information, please contact talk@dhammahouse.org.